With the 171st pick in the NFL draft, the Buffalo Bills selected QB Nathan Peterman from Pittsburgh. Peterman fell to the fifth round in part because he does not have a strong arm, but he has a quick release and is accurate, which both translate well for the next level. 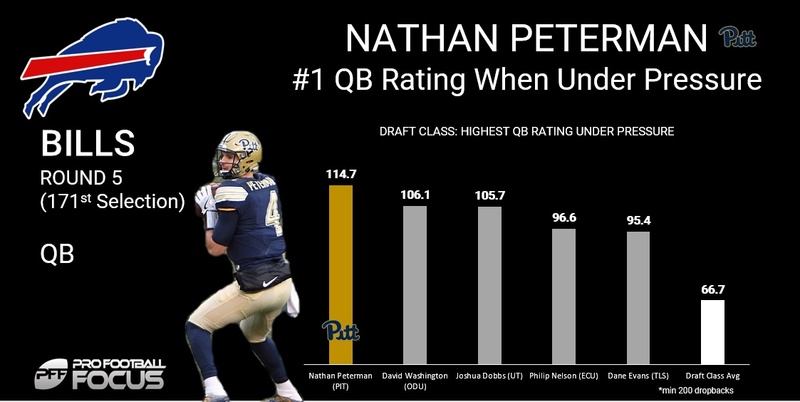 In PFF’s position rankings for the QB class, Peterman ranked fifth. When pressured Peterman had the nation’s No. 2 overall passer rating at 114.7. He boosted his completion percentage by 9.8 percent on play action passes, the eighth-largest improvement in the class. Passing in 2.5 seconds or less: 69.9 percent completion, 18 TD, 3 INT, 124.6 QB rating.